On February 17, 2013, five men set out from Woods Harbour, Nova Scotia, aboard a 12-metre fishing boat called the Miss Ally. Despite a non-functional spotlight and warnings that a massive winter storm was approaching, the ship’s captain, 21-year-old Katlin Nickerson, decided to take a chance on staying out in the open water in order to retrieve his gear and net a hefty haul. Shortly before 11 p.m., Nickerson made a final distress call, reporting massive 10- to 15-foot waves and damage to his vessel. The call ended abruptly. Nickerson and his crew were never heard from again. It is this story, and the events preceding and following that fateful night, that Nova Scotia journalist Quentin Casey presents in The Sea Was in Their Blood. The telling is not always smooth sailing. 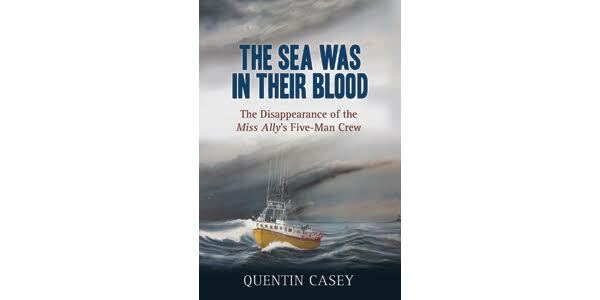 While the middle section of the book detailing the nautical disaster is a propulsive account of errors of judgment, harrowing conditions, and unfaltering bravery, Casey spends too long introducing the five members of the crew in the lead up to the tragedy. Each man is given a full chapter, an admirable attempt to honour the victims, no doubt, but as the men have similar backstories – all came from fishing families and had been going out on trips since childhood; none graduated high school; all were drawn to the money a good fishing season could bring in; most were thrill seekers and known to take a casual view of the law – the result is a loss of distinction rather than a clear impression of each. The small community of Woods Harbour, and those who banded together to try to salvage the Miss Ally (after the Coast Guard abandoned the search-and-rescue operation when it became clear the men had perished), are painted as heroes. In contrast, the efforts of the government, military, and nautical agencies that initially answered the call of distress are questioned, if not disparaged outright, a reflection of the community’s opinion. Casey was granted access and interviews by all but one of the lost fishermen’s families, and the book feels like a writer trying to do right by his subjects at the expense of telling the story objectively. The book may appeal to those familiar with the tragedy or fans of disaster fare, but those hoping for a Canadian version of The Perfect Storm will be left wanting.